Pluto, a Seattle based VR startup which reeled in a $14 million Series A investment last year, today launched their unique Pluto application in Early Access via Steam. 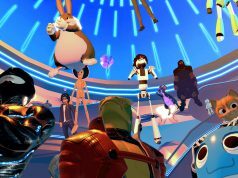 Instead of functioning as a standalone VR chatroom like many social VR apps, Pluto brings the fabric of social VR to any SteamVR application, allowing friends’ avatars to join you for a chat inside of whatever virtual world your inhabiting. I had a chance to check out the latest build of Pluto, and used it to join the company’s co-founder, John Vechey, and communications manager, Serah Delaini, for a virtual chat. 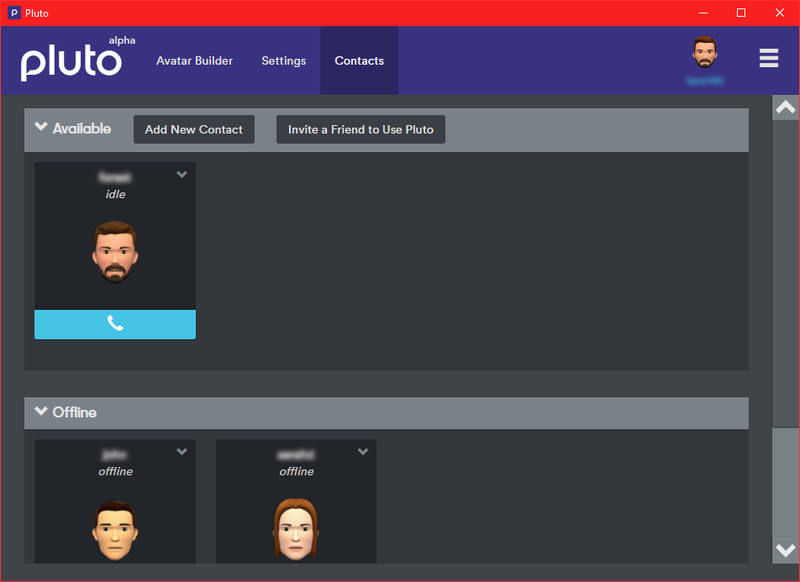 After installing Pluto through Steam, I launched it and, using a desktop interface, was able to quickly make a new account, configure a handful of avatar options, and then add Vechey and Delaini to my contact list via their usernames. Once we were connected, a call dialogue popped up on my screen; I clicked the Answer button and then put on my headset. Though I found myself standing in SteamVR’s usual ‘void’ space, suddenly the avatars of Vechey and Delaini, represented by their floating head and hands, appeared in front of me. We greeted each other and began talking, similar to a number of other social VR applications out there. The beauty of Pluto though, is that Vechey and Delaini’s avatars stayed with me no matter which application I was in, instead of requiring that I stay in the same virtual space as them. I was able to paint in Tilt Brush and vault across obstacle courses in Climbey, all while continuing to see and talk to the pair. For now, I can’t see their environments, nor can they see mine, save for the ability to use a keybinding to send a screenshot of my view, but the Pluto team says they’ve got a few different ideas for how users can let others participants see inside of their current VR application. 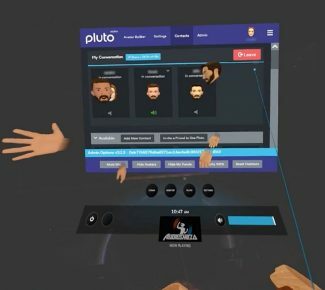 Pluto is neatly managed from its own menu found inside the SteamVR dashboard, with options to hide the avatars of those you’re talking to (while allowing you to continue to hear and speak), invite new people to the conversation, and more. Vechey told me that the company is taking a narrow focus; they want to solve VR cross-app communication and do it well, without being tempted to create yet another social VR app which is isolated from other VR apps. Part of that focus has been on optimizing for latency, Vechey said, in order to make the person to person communication feel as natural as possible. 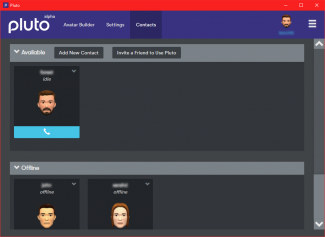 The voice chat portion of Pluto is of decent quality, and also positional, and through I don’t have any hard numbers, the back and forth nature of conversation did feel very tight. With Pluto, you can have virtual chats with people no matter where you are inside of SteamVR, regardless of the application you’re using. 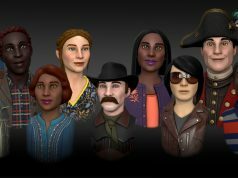 While it’s not terribly hard to do the same sort of thing with existing voice-chat only solutions, being able to look at the avatars of the people you’re speaking with, and hear their voices actually placed in space rather than coming from inside your head, makes the communication feel a lot more immersive and natural. 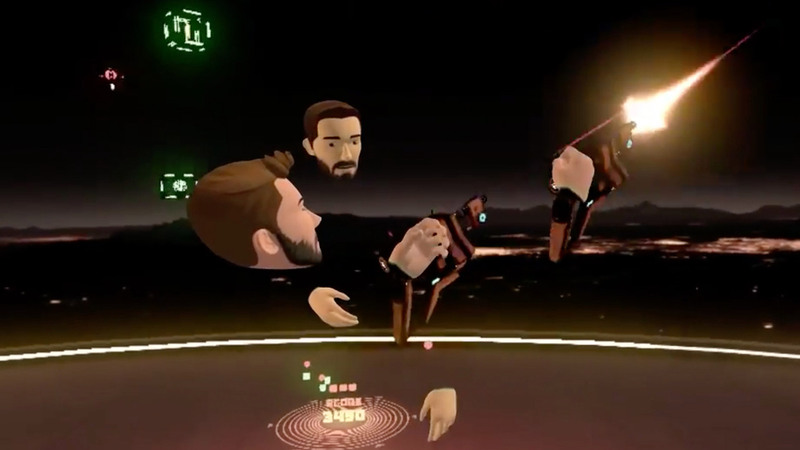 While most social VR apps, like Facebook Spaces, are trying to bring people into their application and then let people have experiences inside, Pluto is taking the inverse approach. By effectively creating a platform-wide foundation for VR communication, Pluto is filling an important need that the various VR platforms haven’t solved yet. 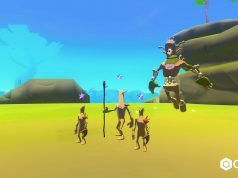 If the company succeeds, it could make VR as a whole feel a lot more interconnected. But that’s just the start. Pluto’s long term roadmap is even more ambitious and takes an impressively long view. While today, Pluto runs essentially unbeknownst to other VR applications, Vechey says that, in the future, there’s benefits to be had by making applications aware that users are chatting together in Pluto, like allowing the application to communicate with Pluto to use it’s own avatars and voice system, or vice-versa, making the whole ‘VR inside of VR’ communication that much more seamless. While today Pluto offers little in the way of user to user interaction beyond voice and body language, the company has been experimenting with the first inklings of Pluto-to-app interactions. Serah Delaini, the company’s communications manager, demonstrated how she could send me a Tilt Brush painting through Pluto, which I could open and view inside of my own instance of the game. While many VR applications aren’t designed to handle this kind of sharing, Vechey told me, the company is working with standards groups with the hopes of advancing that discussion, such that objects and information can move more freely from one VR app to another, with Pluto as one possible bridge. Vechey pointed out that what Pluto does—projects arbitrary information into another reality—is conceptually similar to doing AR inside of VR. Indeed, the company fully expects its solution to expand to AR in the future, and bridge AR and VR together, such that you could have users in a given Pluto chat projected into whatever reality you’re currently in, whether that be your actual reality or virtual reality. In the long run, Vechey says, the company is building Pluto for a future where virtual people, objects, and environments are fluid, rather than intrinsically linked and quarantined within individual applications. Much like I can take a picture on my smartphone’s camera app and then share it to Facebook—where it can then be downloaded, modified, and then shared again elsewhere—Pluto’s vision of the future of AR and VR is one where we I might be able to join a friend in VR, and then choose to share a 3D model I built in Google Blocks by simply opening the application, picking up the model, and handing it to my friend, who could then take and use that object in whatever reality they are currently inhabiting. Pluto, Vechey hopes, would serve as the underlying fabric making that possible. Wow!!! This sounds VERY cool. Hope it gets fully cross VR system useable.